Whilst I do not want to give any time or credit to someone who believes alienating their children from a parent is appropriate I do think it is important we understand the motivation behind the behaviour and the impact it has on them. Firstly nothing you did made them chose this path. No matter what they tell you. This was always in their game plan, you just weren’t looking for the clues. They will tell you that it’s because you did x,y or z but the reality is that it’s part of their character and would have come out sooner or later anyway. So many alienated parents are crippled with guilt over something they did and believe that if they had done things differently, they would be reasonable and the kids would not be suffering . NEWSFLASH. It is the alienating parent who is at fault NOT YOU. Please believe that. Many alienators have this as their game plan all along. They decided when they met you that they needed you because you met their needs – you gave them status or you were easy to manipulate or both. But deep down they knew that you were “out of their league” so they concluded that whilst you may not love them and therefore leave them, you would love your child and be very reluctant to leave them especially if the threat of losing them should you ever dare to leave was planted in your head. Things would have moved really quickly. Moving in, getting pregnant etc. Often without much agreement from the yout. You may even have been breaking up when they got pregnant. You could even have been raped (men and women). However it happened this was stage one of their plan. Keep you in a relationship with them by giving you a relationship with the child. At this point some of their plan will have been revealed if you knew what you were looking for. They perhaps would have spoken about how they would graciously “allow” you to see your child as often as you like. You are the father. It’s not about allowing. It’s about being right and necessary for the child. But by using the term “allow” they are revealing their view on the power differential and already acting as a gatekeeper. The attachment is insecure and based on fear. Their subsequent behaviour will come from this place. Once pregnant the boundaries you tried to put in place were torn down, always with the veiled threat of not seeing your unborn child. At this point they will have you running around after them, almost slave like, as they relished their now guaranteed power over you. At this point they may have raised marriage and moving in together (if you didn’t already) or some other way to really seal the deal. Psychologically at this point they are getting a huge amount of positive reinforcement that they made the right choice. You are attentive (of the child not her but in her eyes it’s the same thing) and the arguments have stopped (because you don’t want to cause stress to your unborn child but she takes it that you love her more now) and she keeps pushing, knowing you won’t go anywhere. They learning that they can get away with pretty much anything as long as they use the child as an excuse. They is also developing the sense that her and the child are one and the same. You love the child therefore must love her. You want to be with the child therefore you want to be with her. This will be reinforced more once the child has arrived where the child will become a mini-me. Everything they wanted for themselves, they push their child to do. If it’s a girl, they dress them the same and model them on themselves. If it’s a boy, they will view them as a mini-me of you. This can lead to very poor boundaries and inappropriate behaviours as the children grow up. But whilst the child is small, they get lots of praise for “how gorgeous” the baby is (which the alienating parent takes to mean “I am gorgeous”) so they become tied to this tiny symbol of themselves because the attention they get makes them feel good. As they grow up and the attention dwindles, the alienating parent may develop fabricated illness syndrome as a way to get more attention or push the child to perform so that they get lots of praise, which the alienating parent takes as being praise for themselves. Parent’s evening can reveal a lot of this behaviour. Obviously though the relationship becomes more strained again as old feelings of unhappiness rear their head and you contemplate the future of the relationship. At this point, picking up on your withdrawal, you may find another pregnancy take you by surprise. This is their “insurance”. They will start to belittle your parenting skills and begin a secret smear campaign. They will be telling others that you have “issues” and may even succeed in getting you diagnosed with a mental health problem. This is ammunition for their ultimate game plan should the relationship end. During arguments they will use the children to “control” you and win the fight. They may even attempt to goad you into attacking them (which is wrong and is not condoned – I am simply explaining the process). This will give them more ammunition should you leave. You won’t have any say in the parenting. They will make all decisions. They will plant the seeds of the “consequences” of you leaving them – “you’ll never see your kids again”. Your confidence will be in tatters and you will feel trapped. Paradoxically they will feel incredibly powerful and almost god-like. They will present to everyone else as the “perfect” parent, all the while putting you down, and are keen for everyone to think you have a perfect family life and they are the perfect wife/mother. They have exactly the status they desire. As the arguments increase or the alienated parent becomes so depressed everyone starts to notice, they may decide that you can no longer meet their needs and provide them with the status they desire so they could discard you. Equally you may decide that you are so unhappy and it isn’t fair on the kids to witness the animosity that you want to leave. Either way the break-up will not be easy. It will all be your fault and even if they left you, they will tell everyone how awful you were to live with and that they had no choice. They will not accept responsibility for their actions and this will all contribute to the smear campaign they are ramping up. At this point they will begin with their attempts to alienate you. Usually starting with gatekeeping. Telling you exactly when and where you are “allowed” to see the children and if you step out of line your privileges will be revoked. They will attempt to make the children choose at every opportunity and overshare with them about the details of your break up. There will be no emotional boundaries in place. The alienating parent at this point is in full on survival mode and will attack to protect their status (not their children). False allegations are likely to be made and believed. All of this feeds their view of themselves as invincible and omnipotent. They are lavished with attention whilst they play the victim and this is more positive reinforcement for them to continue with their behaviour. You and the truth are a real threat to their status and so you must be removed. They will stop you and anyone associated with you from seeing the children. They do all of this under the guise of “protecting the children”. The smear campaign which they started whilst you were still in the relationship now appears to back-up their claims and no-one believes the alienated parent. This fuels their power trip and their behaviour becomes more and more outrageous. Phoning the police for every little thing. Making repeated false allegations which are quickly dismissed. Threatening you, projecting and gaslighting you with “evidence” of your abuse. 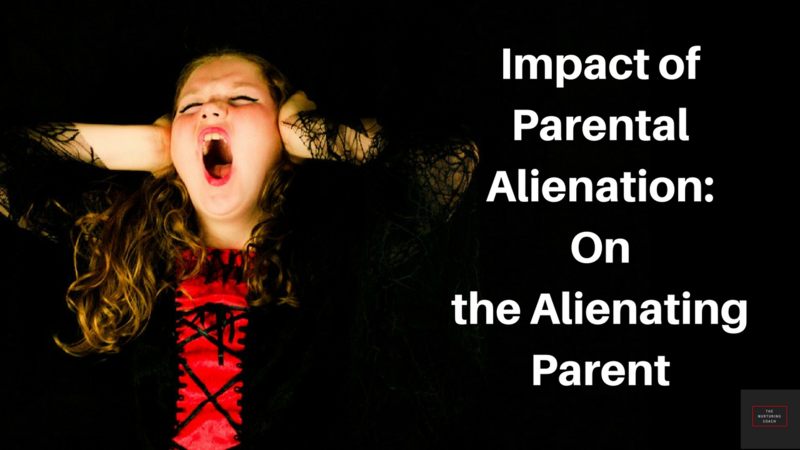 At this point many alienated parents give up. They are facing a barrage of accusations, no-one believes them and they are alienated from not only their children but also friends and society who believe the alienating parent. Add to that the financial element and the emotional toll this takes on everyone including the children and it is understandable why a parent would walk away. Of course this just proves to the alienating parent that they are all powerful and reinforces their behaviour. The key is to fight. The alienating parent WILL trip themselves up. As their behaviour gets more outrageous, more and more people will start to question it and slowly but surely the truth begins to come out. The children need you to fight as well because you are the only parent who is concerned with their welfare. They are being abused and need you to protect them. As the curtain finally starts to fall though, the alienating parent will panic and can become dangerous. They refuse to let anyone see the truth and therefore those who are exposing them become a target. Including the children. Their psychological state has resorted to childhood and are in fight or flight. Some will kill themselves at this point. Some will kill their children. Some will kill their ex. All in with the aim of protecting their false self.